MHA has published an issue brief on the Centers for Medicare & Medicaid Services’ proposed rule to expand its Medicare coordination model to encompass additional cardiac and surgical procedures. As previously reported, the rule also proposes new standards for Medicare payment for cardiac rehabilitation and physician services. The proposed rule is to be published in the Tuesday, Aug. 2, issue of the Federal Register, initiating a 60-day period to receive public comments. MHA has made available self-assessment checklists for acute and critical access hospitals to aid in their internal assessments of compliance with state hospital licensure regulations, Medicare conditions of participation and interpretative guidelines to the CoPs. The checklists may help hospitals improve staff knowledge of the regulations and decentralize the responsibility for regulatory compliance from the administrative offices to all department managers. MHA has updated several of the checklists for CAH’s reflecting the latest regulatory guidance available. Updates have been made to the following checklists: discharge planning, the Emergency Medical Treatment & Labor Act, food and nutrition, infection control, laboratory services, medical record services, nursing and patient services, outpatient services, quality improvement services, respiratory services, and utilization review. The Centers for Medicare & Medicaid Services has issued guidance to surveyors on federal requirements for providing services to justice-involved individuals. The guidance specifies that the Emergency Medical Treatment & Labor Act applies to all Medicare/Medicaid participating hospitals with specialized capabilities. A hospital does not have the option to refuse services to justice-involved individuals unless the hospital lacks the capacity and capability to do so. A participating hospital is not permitted to establish a unit or part of the hospital that is not fully available for the care of any appropriate Medicare/Medicaid beneficiary. The guidance has specific application to hospitals, psychiatric hospitals, critical access hospitals and nursing homes. Beginning in calendar year 2015, hospices were required by the Centers for Medicare & Medicaid Services to submit hospice quality reporting data or risk cuts to their fiscal year 2017 annual payment update. CMS mailed notification of compliance to hospices on or before June 29. Hospices that receive a letter of non-compliance may submit a request for reconsideration within 30 days after the date documented on the non-compliance notification letter. CMS will not accept any requests submitted after the deadline. A request for reconsideration can be submitted online. The July issue of Trajectories discusses the importance of diabetes management. Type 2 diabetes is preventable. It is important to identify and stratify at-risk populations, increase access and affordability of care, increase screening and prevention, follow evidence-based practice guidelines and recommendations, and increase self-management by working with disparate communities. Stakeholders that work to improve care for patients with diabetes can achieve population health gains and reduce overall cost of care. Addressing individuals with chronic disease, such as Type 2 diabetes, is only one strategy. We have to start earlier, drive awareness, provide education and meet the patient “where they are” across their lifespan. This calls for moving providers, not patients, to achieve the level of engagement necessary to experience true progress, and these efforts are demonstrating significant impacts across the nation. One measure of a population’s health is mortality rate. Missouri’s rate of diabetes-related deaths per 1,000 shows another alarming disparity — black males older than 68 have a much higher rate of dying from a diabetes-related condition compared to white males, white females and black females (Figure 17). The stories shared through this publication represent only a few of the innovative, cost-effective and results-oriented work being done to improve diabetes care in Missouri. There is work to be done to continue closing the gaps in access, affordability and equality in health and health care throughout the state and to increase the patient’s ability to prevent a diagnosis, or better manage their disease, to prevent life-altering complications. Since no single provider or entity can do this alone, strategic and collaborative partnerships are needed to bridge the known connections between health and factors preventing health equity. For more information on diabetes, read this month’s edition. The Centers for Medicare & Medicaid Services has issued the first round of hospital-specific data from its overall hospital quality star rating system. The data is posted on Hospital Compare. As previously reported, today’s release was expected and followed a delay of several months. MHA has issued talking points. 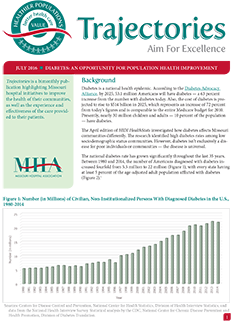 MHA has released the 2016 workforce report along with 10 region-specific reports, which find continuing high rates of vacancy and turnover in hospital-based health professions statewide. The report includes data from 148 hospitals and identifies trends among 36 hospital-based positions and five clinic and physician practice positions. This year’s workforce report highlights the need for all stakeholders to work collaboratively to strengthen and enlarge the state’s health care workforce to deliver the workforce needed to care for Missourians in the future. The turnover of each bedside registered nurse is estimated to cost a hospital between $36,900 and $57,300.